Some of you may not like the idea of looking like a gremlin even for Halloween so I have created a Victoria's Secrets Angel look. Victoria Secrets models are known for their ridiculous good looks so this would be perfect for someone wanting to dress up but not wanting to look scary. I achieved this look by keeping the make up soft and feminine. I have used a lot of make up but the colours that I chose (totally inspired by the close up pictures of Victoria's Secrets models) are subtle. I also curled my hair using the Babyliss 25mm curling wand; I don't think I've ever come across a picture of any Victoria's Secret Model with straight hair; the Victoria's Secrets stylists do like the wavey look. The main part of my Victoria's Secrets look has got to be the outfit. 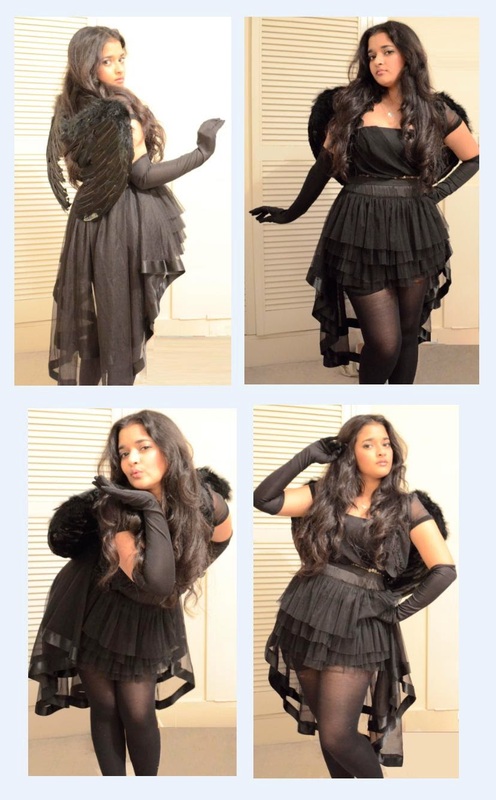 I teamed up a mini dress with a mini tulle skirt, added some wings, black gloves and a skirt overlayer. I have to pat myself on the back here as I am definitely reusing some props from two looks I created last year. If you are a regular viewer, you may have seen me wearing the skirt overlayer in the 1900's video and the black gloves in the 1920's (yay for the hoarder in me!). And of course, the tights are completely optional. I chose to wear them as I felt it made the whole look more classy and put together; I don't think I would have liked the outfit quite as much with bare legs.